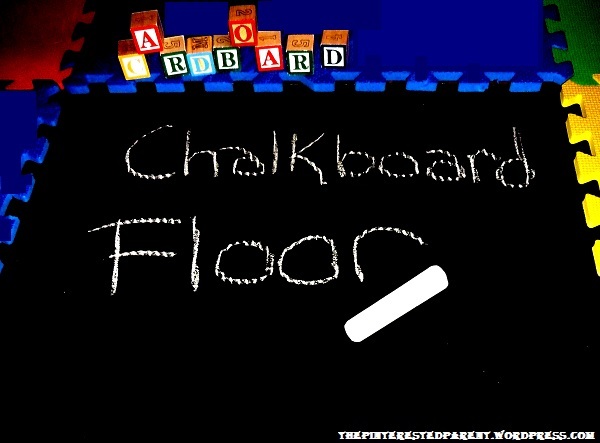 I have seen & heard about chalkboard paint for a while now. I have seen it used on everything from full walls to refrigerators, coffee tables & baking sheets. Some of the projects I have seen have blown me away. One woman had a chalkboard accent wall behind her bed. 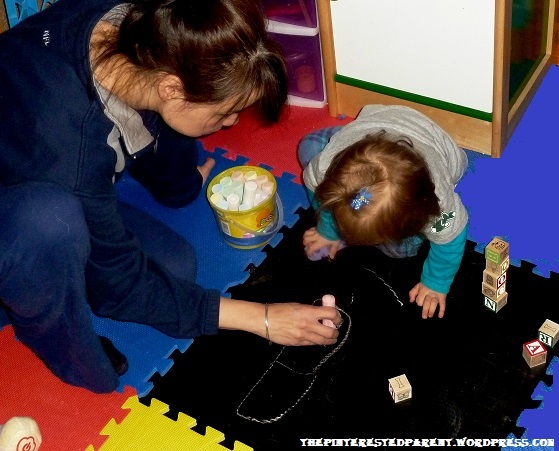 She designed her own chalk headboard and chalk wall hangings. Amazing! I have always wanted to try it because let’s face it, the stuff is pretty cool. I am not quite as ambitious as some of the great ideas that I have come across. I merely wanted a fun little area for my daughter to doodle on. Mai has a fenced in play area in our living room with foam matting & a kitchen & toy boxes. I wanted to make her a small area on the floor to draw on kind of like a sidewalk. I have seen the paint used on wood, metal & glass & heard that you could use cardboard as long as it is sturdy. I opted to try it on cardboard since this was my first attempt & I have plenty of it readily available. I used the chalkboard spray paint. I found the spray paint to be rather messing. I followed the instructions but the can leaked a lot, so make sure to use gloves. I think the next time I will try the roll on. I found a sturdy piece of cardboard. 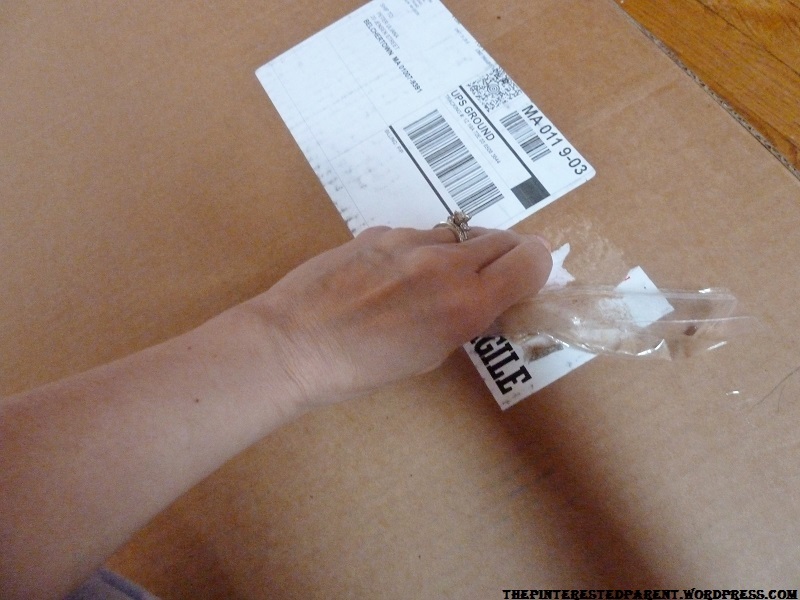 Make sure if choosing cardboard to use on that is rigid & that will not crack or indent if you put pressure on it. Peel of any tapes or stickers until the cardboard is smooth and clean. 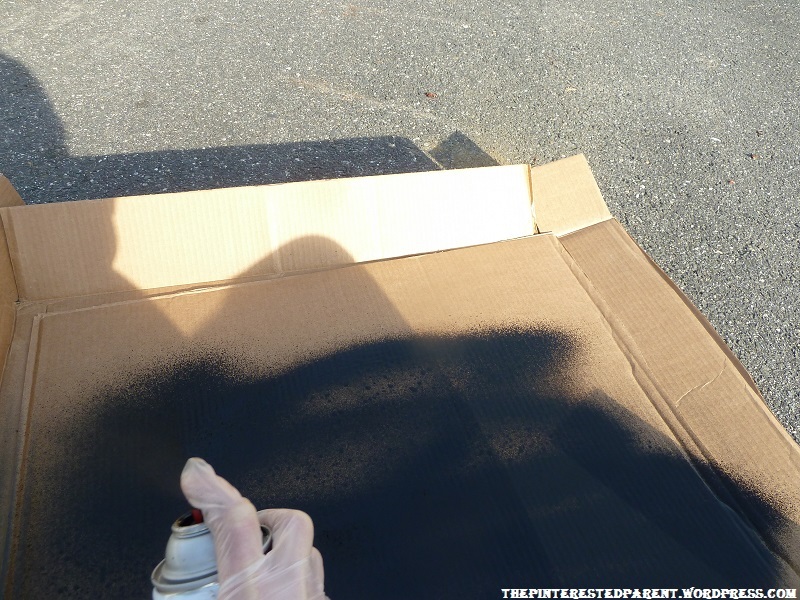 The fumes are strong, so I brought my project outside to use. I placed a second piece of cardboard underneath to collect overspray. The can recommends using two coats. I covered 4-5 times until I finished the can. I removed one of the foam mats in Mai’s play area & placed the finished project in its place tucking it under the surrounding foam squares. I show Mai her new chalkboard & she asks mommy to draw a train. & shows off her artistic skills. Mai loved this & so did mommy. The paint works just as well as everyone says that it does. I can’t wait to find something else to paint. Thank you. She does like it. Thank goodness. It was fun to do. I want to spray something else now. That is just so easy and billiant. And the best part is you can throw it out and easily make a new one. I know. The cardboard was simple. Like I said, I had it on hand. It was a great test piece before I went to a different surface. 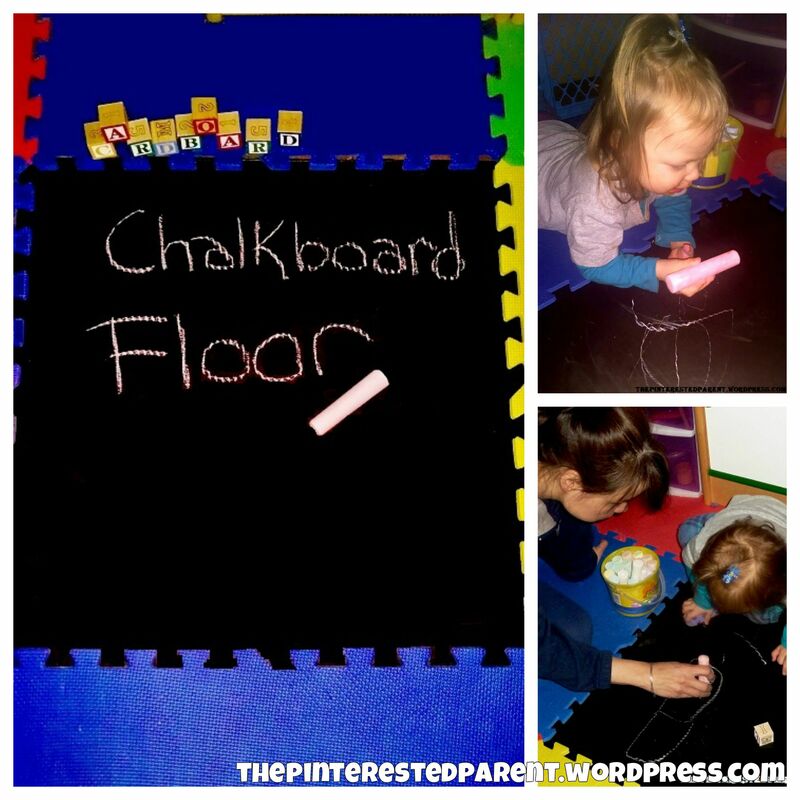 I had never heard of chalkboard paint until a friend told me about it. They did a cabinet in their kitchen with it and it became a noteboard. I would like to try a different surface such as that soon too. Awesome idea. I have wanted to pick up the foam flooring for my 16 mo old twins to play on. I think I’ll have to do this with a square or two now. I didn’t actually spray the foam flooring. 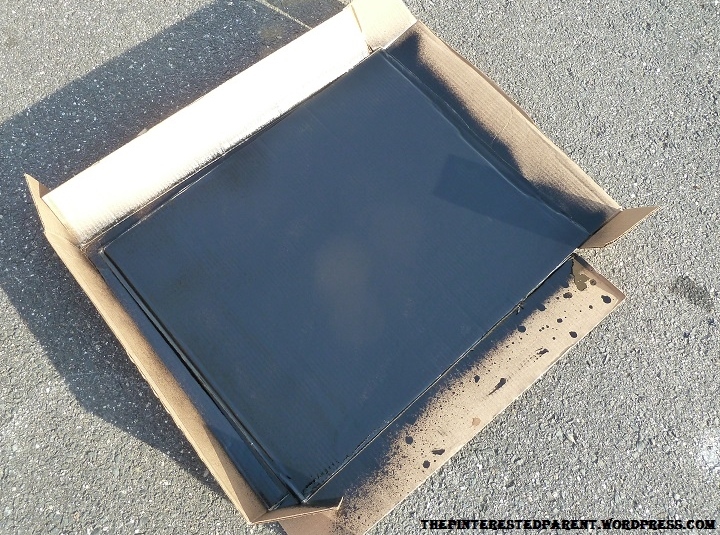 I spray a piece of cardboard & replaced a foam square. I’m dying to try this too! I just have to find the right spot… oh, and the time.. lol 😉 Good to know that your little one loved it! I will do it again. That stuff is great. The closet door is a great idea. I would like to try a larger area like that as well. I didn’t paint the mats themselves. I did a large piece of cardboard & put it in the place of the matting. I would like to try a wall as well in our hallway. 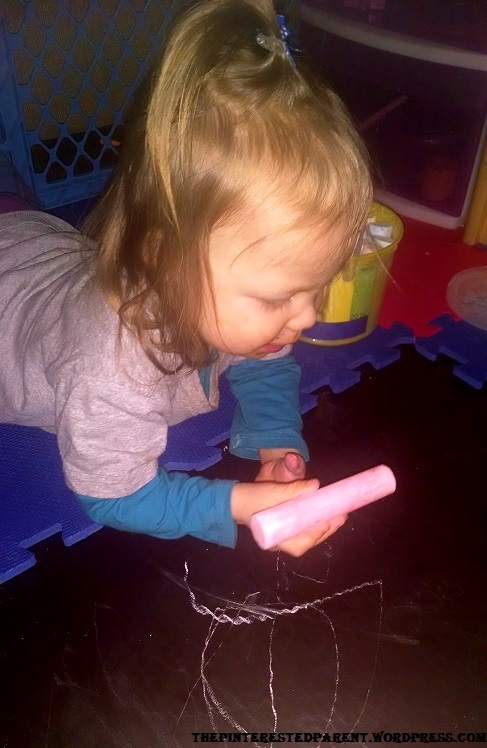 She has art work & felt boards hanging there, so she plays thee often. Let me know how it goes if you try it. Hi ! I love this idea! I ‘m addicted to chalk board paint and I use the spray kind all the time . I’ve never had issues with it nor has it leaked for me. Great project coming over from the MaMade Blog Hop. Thanks Kim. I want to spray my whole house in it. It is very cool. Thanks for hopping over. This is brilliant! I have had our foam mat up in the closest for a couple months now. Think I am going to have to give this a try! Thanks. I did not spray the matting though. I am not sure if it would work on there or not. It is a piece of cardboard that I sprayed and then replaced out one of the foam tiles. It has been a fun addition to the play area.